Happy New Year to all my readers! Today its a challenge weather MVC or Budweiser would finish first. Open a bottle of Beer or Budweiser I prefer Budweiser instead of Beer! Now lets start coding... We will take step by step approach.. So now we know what approach to follow. 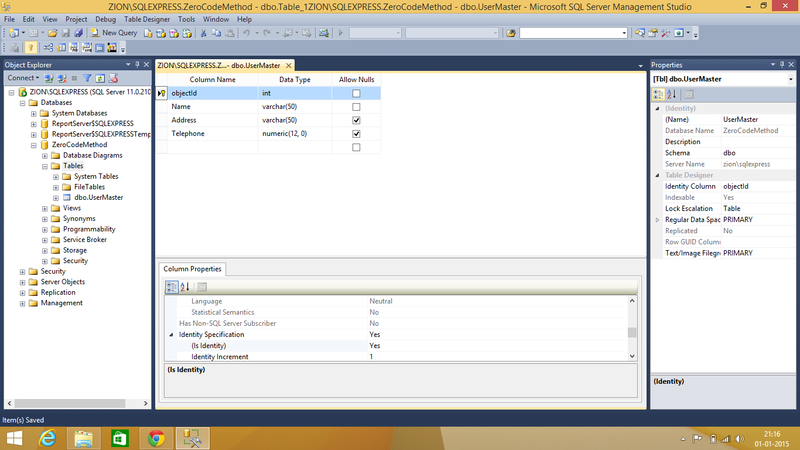 Lets create a Ms SQL database first lets name it ZeroCodeMethod. Now create a table inside that say for UserMaster simply by doing New Table. Once done with new table creation simply add required columns as shown below. Once columns are created set the Primary Key and its Identity Field. Please note Primary key should be the Identity field. That's it our database is ready. Now lets start the best part coding. Oh! ya right coding! After few sip you must be having a roller coaster effect!!! Don't worry I'll make the coding part minimum, that's my promise. Now take a sip of your drink because its going to be a one shot activity for next few minutes. 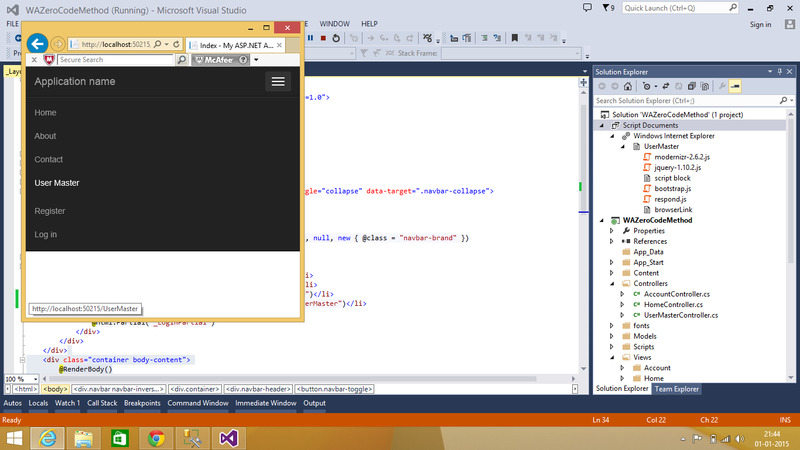 Now quickly open your Visual Studio mine is 2013 whats yours? 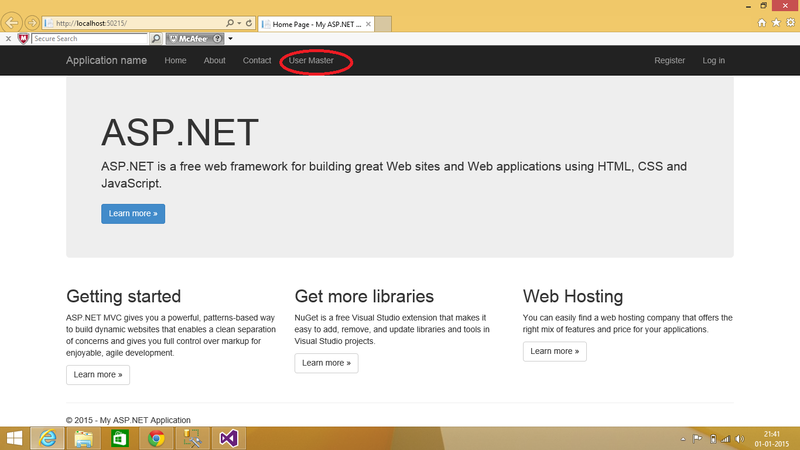 Select New Project > Now Select Web ASP .Net Web Application > give a good name to it I'll say Zero Code Method > Now select MVC and go ahead. Give a proper name to the model something like MUserMaster identifying the table. After model has been added then create a new connection it's pretty simple as shown in below screenshot. We are done with the Model part. 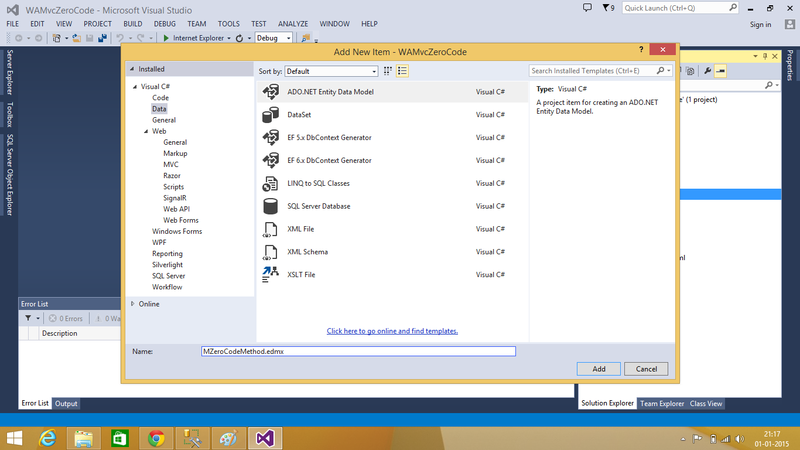 Now to create Controller simply select Add > New Scaffolded item> Select MVC 5 Controller with views, using Entity Framework. If you notice there is something that we are getting for free! 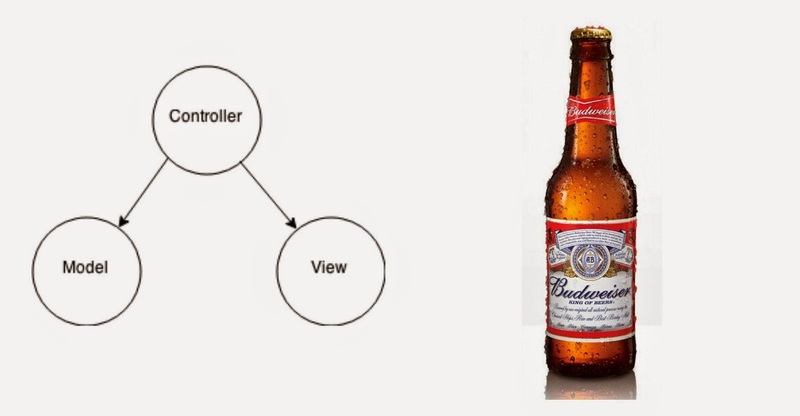 a typical Indian culture that MVC is giving, by one get one free we created Controller and we got View along with it. 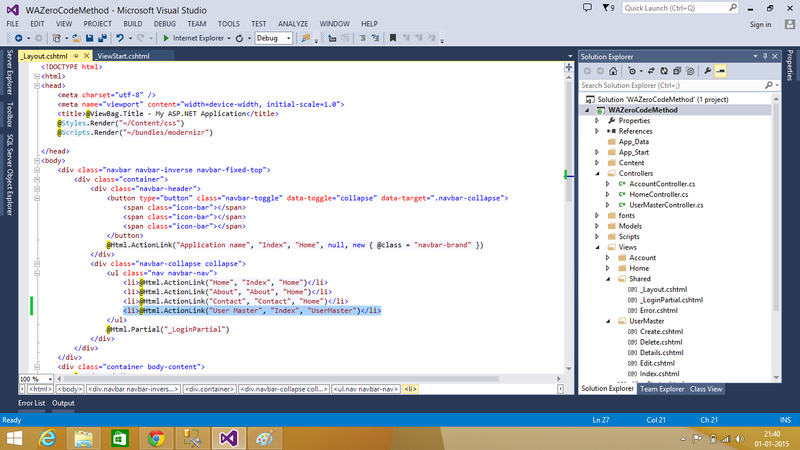 By selecting this template we got a 5 pages made automatically by Visual Studio 2013 itself. Now a little bit of coding as promised I'll make it minimum not more than one line. Open Views>Shared>_Layout.cshtml and then add a pointer that pointing to User Master so that it displays in the menu. Simply copy paste this line into menu section. 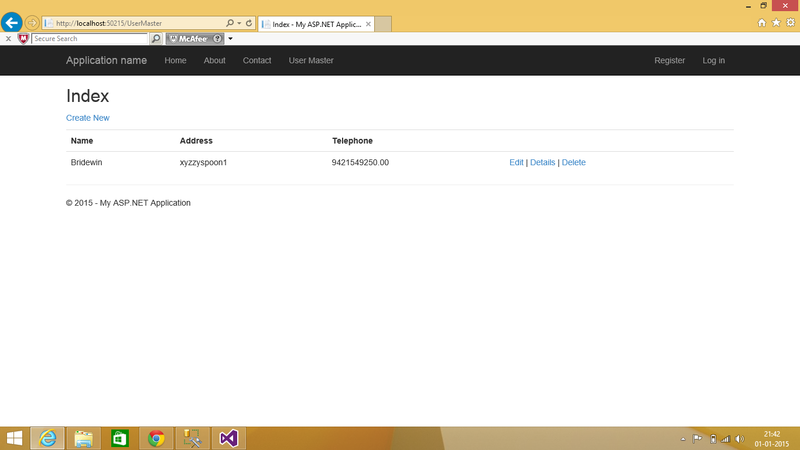 Now your main page should look like this once compiled in visual studio. To add a record simply click on the User Master and then click Create. Now add a record as shown below. Click on create to create a new record. Added record should be visible as shown below. In case if you wish to Edit/Delete/View details click on the respective links. As part of Indian Culture... Again something free... This site will also work fine in mobile browser because it is using Boot Strap to prove that simply re-size the browser and on the fly the menu will adjust automatically as per the size of the browser. 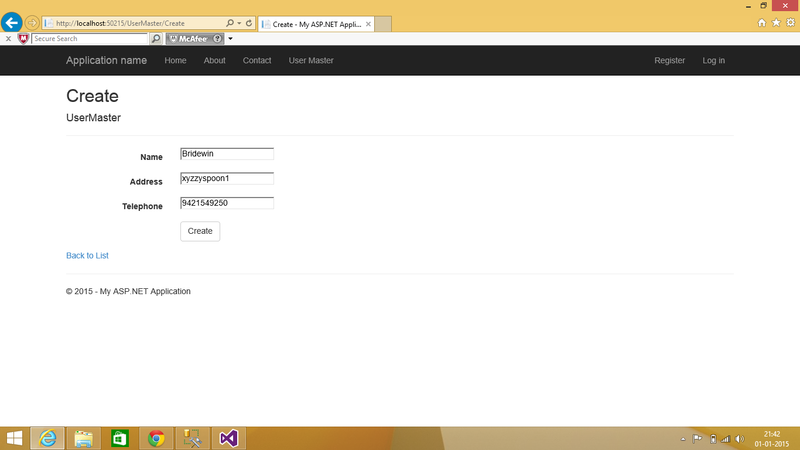 That's it we are done with the Creation of MVC Zero Coding Method or Database First Method. The advantage of this method is that this has minimum amount code to be written because this is highly reliable on the database part. Similarly you will find some other methods like Code First Method etc... Its up-to you which method to follow. I'm sure that you will be having your drink in the bottle to finish!!! In case if you were unable run or complete this project successfully just download the code and check what have you missed. That's all folks!!! Stay tuned for upcoming posts.